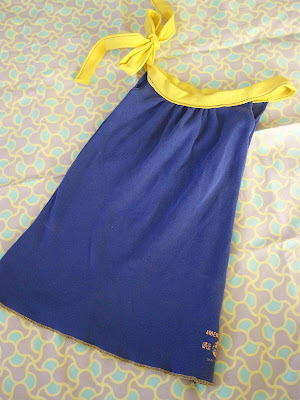 Last week I mentioned that the Warhol dress from Dana at MADE was on my project to do list. I finally got around to making it. I started out using a that bright yellow T-shirt that you saw in the photo of my previous post, and added a royal blue shirt that I've had for 10+ years (isn't it sad that I'd held on to it for that long?). 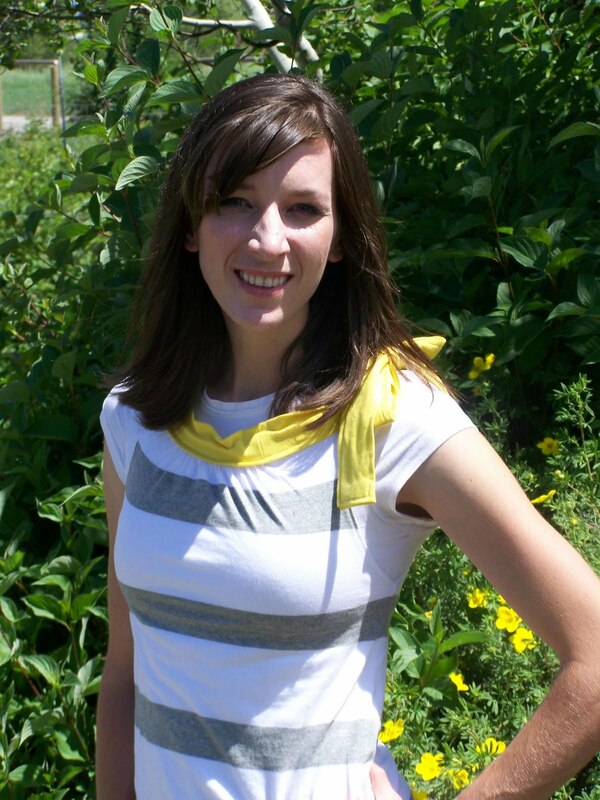 The blue shirt had yellow stitching around the hem so I thought that the two shirts paired well together. The pattern really was simple to follow. I had a difficult time determining how long I should make the collar (because I didn't have a model to try it on) right now it looks quite long, but I can always take it in when I need to. 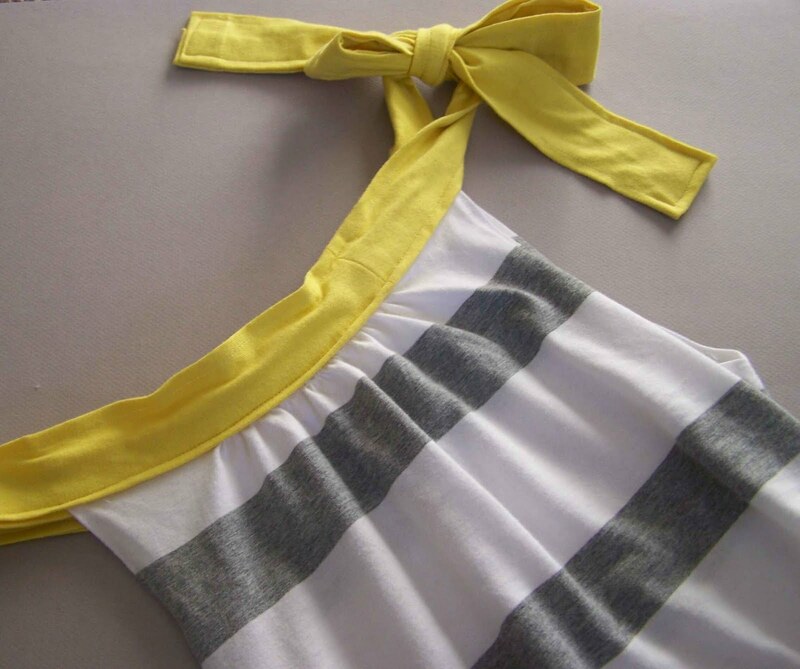 After making the adorable dress I knew that I really wanted to convert the pattern into a top for myself. I laid out the toddler dress pattern, stacked a tank top of mine on top, and then adjusted the pattern as needed (factoring in seam allowance, and adjusting the width of the pattern so it would wrap around my trunk). I had to cut the V neck off of my striped t-shirt so I basically kept all of the length of the t-shirt. When it came to making the collar I believe that I used a strip 8 inches wide. I also cut three 23"strips which I sewed together to create 1 long strip. The collar ended up being the perfect length. After I had the body of the shirt sewn together I tried it on to determine the position of the collar. I had planned on adding pockets to the front of the shirt or maybe a ruffle of contrasting color just below the collar, but it didn't happen. Maybe next time. I really like the fit of the shirt and like the way that it turned out. 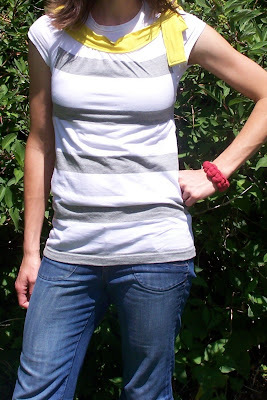 (and I really love my jersey knit bracelets seen in the photos-come back tomorrow for a tutorial). The most difficult part of this particular project was the fact that I was working with knit. 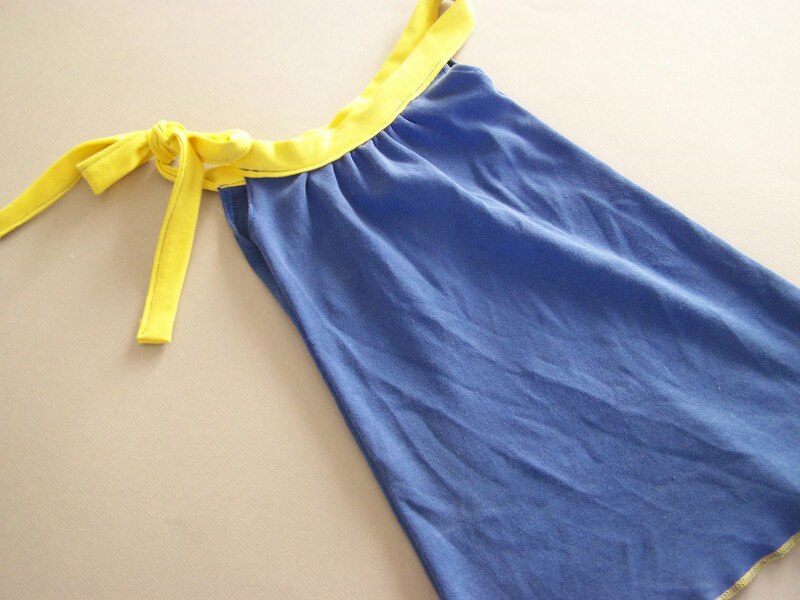 I am relatively new to sewing, and I don't have much experience working with knit. The Yoga Pants from a couple of weeks ago were much prettier on the outside than the inside. Luckily, the night before I started this project I stumbled upon some helpful information. Here are some tips and tricks that I found. Made by Rae shared that you can stack thin paper on top of your knits to fool your machine. 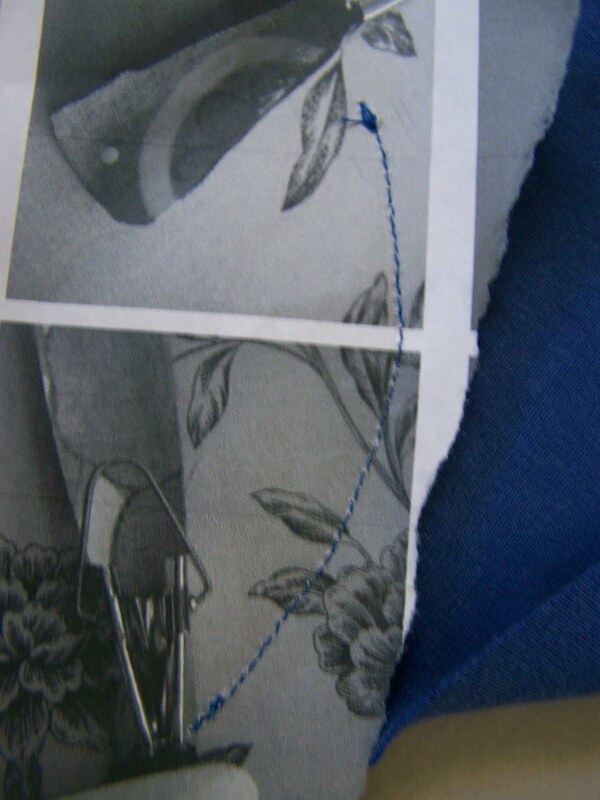 Instead of thinking that it is sewing knits it thinks that it is sewing paper (which technically it is sewing both). Rae suggests cutting pieces of paper to match the curves of your pattern pieces, but I was too lazy. I used one piece of paper, placed it on the bottom of my stack of fabric, and it worked like a dream. The paper is perforated by the needle and easily pulls away after stitching. If you have any pieces of paper left behind, I've found that it is easy to dislodge them with a pair of tweezers. I can't remember the exact source, but I recently read that they make Jersey knit needles for your sewing machine. I don't actually own any (I looked yesterday without luck), but they are supposed to push through the fabric rather than piercing it like a universal sewing needle does. Sew Mama Sew also offers these tips for working with knit. 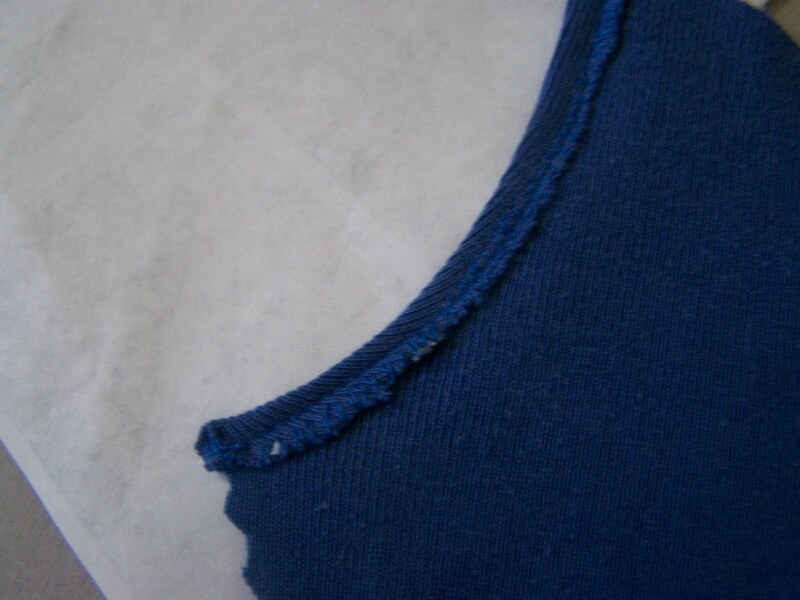 I hope that these tips help you in your knit sewing projects. I love the dress as a top!! This would be so cute with matching Mommy/Daughter outfits. Thanks for sharing!!! p.s. I found you on Lucky Star Land! I love it! And it looks fabulous on you. Thanks so much for the idea. I'm visiting with you with TCB, and I'd love to have you visit me too! Cute & I like the colors you chose! Stopping by from Get Your Craft On Tuesday to say hi & check out your project. So cute! I like how you tricked the sewing machine into thinking it's not sewing jersey! I saw you over at the Weekend Wrapup at Tatertots and Jello!